LIFE® SoftPac Model LIFE-2-612 is a great portable oxygen solution! At only 6 pounds the LIFE SoftPac provides up to 40 minutes of oxygen supply at the FDA minimum 6 LPM "Norm" flow rate, and 12 LPM "High" delivers the AHA recommended 100% inspired O2. The easy-open knurled knob regulator valve requires no tools to open, and prevents accidental turning-on during transit. Mount it to a wall with its wall mount loop for easy access or fit it into your "quick response" bag. The LIFE® SoftPac Model LIFE-2-025 has all the same features and provides a variable selection of 12 liter-flow rates for EMTs and others that are knowledgeable and practiced in administering supplemental first-aid Emergency Oxygen in a wide variety of emergency situations for patient survival. It provides variable-flow with 12 click-stop flow-rate settings of 0,.25,.5,1,2,3,4,6,8,10,15,25 LPM. The SoftPac features an aluminum 240 liter "Medical C" cylinder also known as "M-9" cylinder for Medical - 9 cu ft of oxygen compressed gas. The LIFE SoftPac can be used as an inhalator to administer supplemental oxygen to a breathing victim, or use it as resuscitator to provide oxygen enriched mouth-to-mask CPR to a non-breathing victim. It's the perfect rescue tool to use with your AED. It comes pre-filled and ready-to-use and features a crimp-proof O2 hose and the patented LIFE CPR mask that fits both adult and child patients. Best of all, you can easily replace the disposable cylinder with low-cost LIFE SoftPac Spare Cylinder, or it's refillable by most compressed gas distributors. 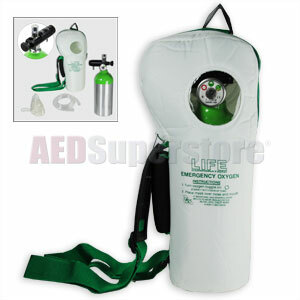 Several options are available and the AED Superstore® has them all above. Note: Because all LIFE® SoftPacs are shipped completely filled and ready-to-use, they must be shipped via UPS Ground. Pricey, but every bit worth it. I carry this and an AED on most road trips, boating, and hiking activities. I used the O2 on one trip at a hotel. Never know when you'll need it. I know the person we used it on was thankful that we carried it. Filling it is difficult due to the various laws in CA, I ended up buying another one.